I mentioned in my previous post that I would share how I have made my tiny kitchen more functional, so here is a tour of my small space. A little background first. After renting for awhile we finally bought our new home a few years ago. We were lucky because we could take advantage of the lower home prices and interest rates. So many people we knew were underwater with their homes, so we felt fortunate that we could buy when the prices were lower. We had a certain price range that we could not go above and there weren't a lot of houses that we could afford, especially here in the Pacific NW. My hubby has a classic car that he needed to store, so we were looking for houses with 3 car garages. That limited our choices even more. Anyway there wasn't anything available that was even close to what we wanted until this house came on the market. It isn't our ideal, but knowing we have an affordable mortgage really helps with the stress of owning a new home. So I should add that we are very grateful to have an affordable home because we know the struggles so many homeowners are going through. Most newer homes have an open floor plan, especially on the first floor if it is two story and ours does as well, but it is really small. 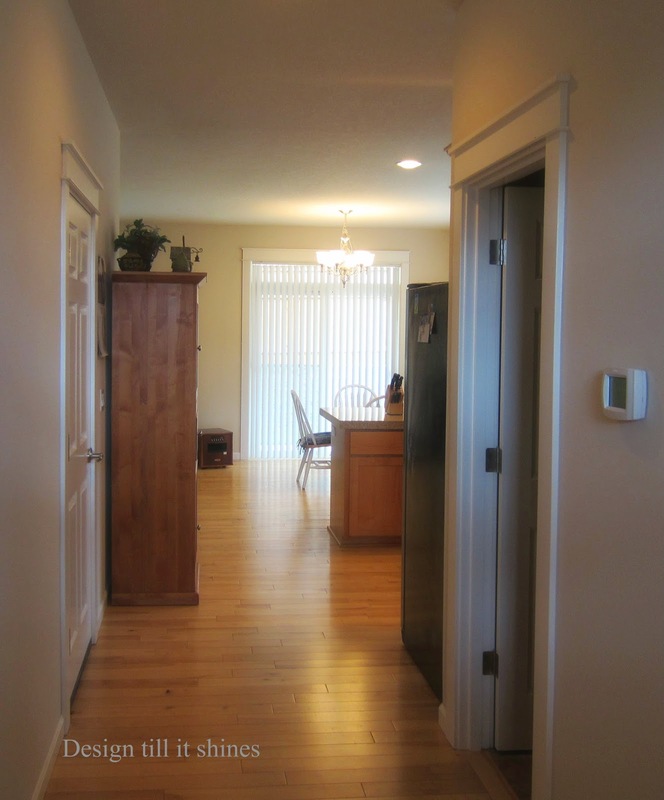 We have just under 1800 sf, but I love the coziness of small spaces as long as there is a nice floor plan. 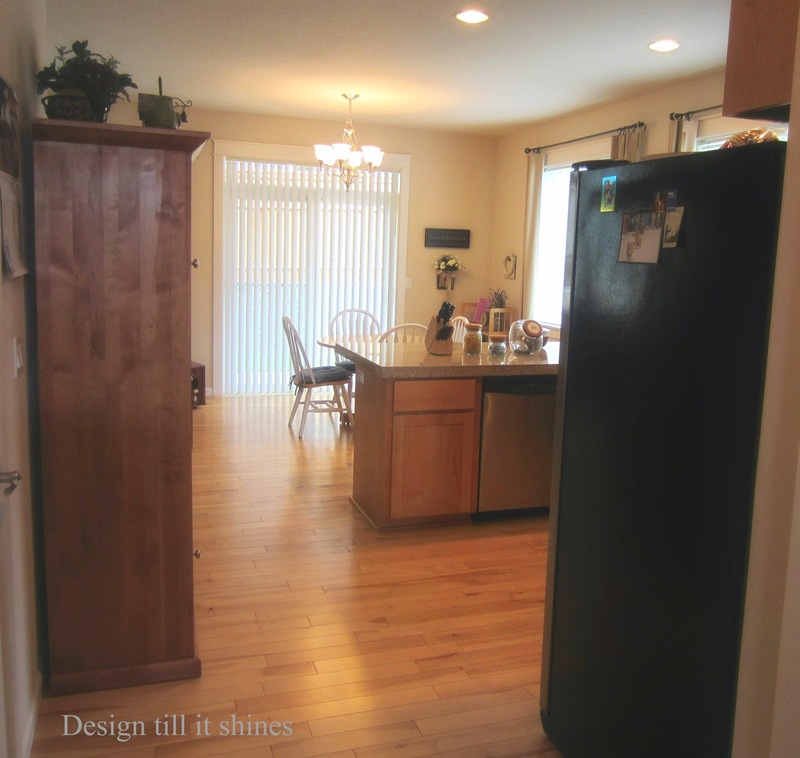 We have a nice entry and a long hallway, but it is a waste of space that could have been used to make a larger kitchen. I'm working on something for the hallway. I hate that it is so plain right now, but I'm a bit of a minimalist decorator with a small bank account, so things are being done slowly around here. I'm hoping to put a vintage hall tree in this space. Also, my photos are not the best with my little point and shoot. I'm still working with my camera and I hope to get some better pics next time. We have a small bathroom on this floor and the door on the left leads to the garage. The vertical blinds on the patio doors are high on my list to go. I am looking at some nice panels to replace them. The kitchen is at the end of the hall. I think the builders added it as an afterthought. They didn't really allow for much kitchen space so they just thought we'll put it here at the end of the hall. 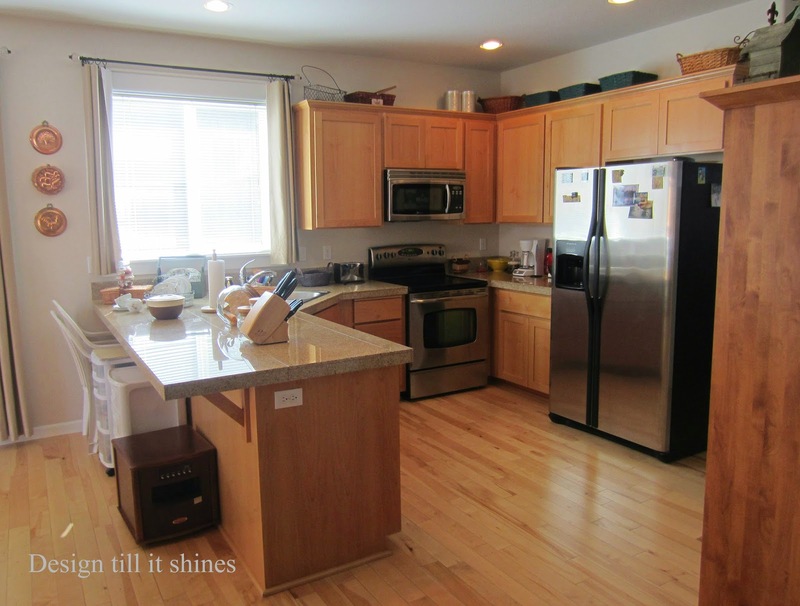 We hated this kitchen when we first saw it, especially me, since it is so small and lacks cabinet space. There are only 3 full size upper cabinets and 1 half size cabinet. Mini sized cabinets are above the microwave and the fridge. There are also only 3 full size lower cabinets, not including the ones below the sink. Four drawers with a pull out drawer below the sink and that is it for kitchen storage. 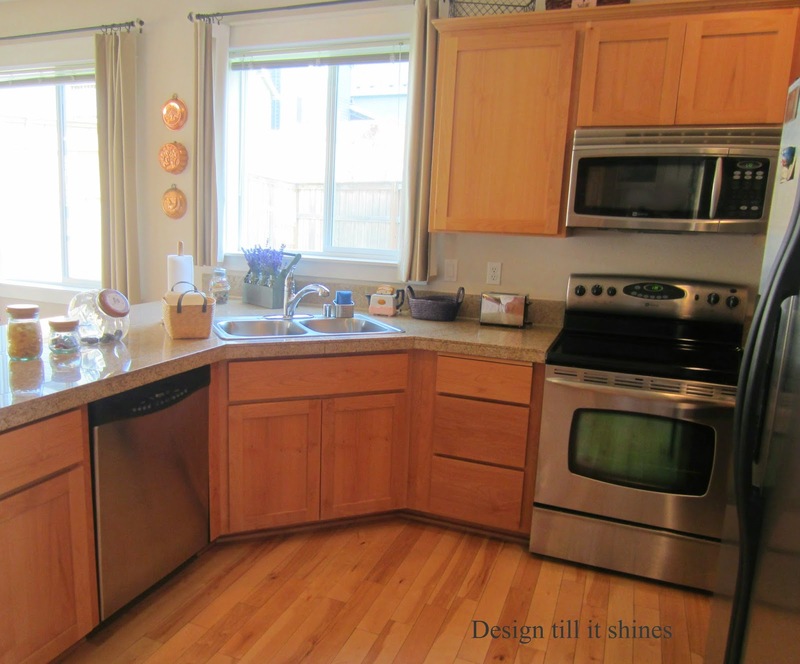 The cabinets are very plain builder basic style and not real wood either. I'm complaining a bit but I was quite disappointed with this kitchen when we first moved in. There is just my hubby and I now, so it works for us but it would be too small for a family in my opinion. For some reason they thought an extra window was a good idea, even though it limited the cabinet space even more. Excuse the glare. I couldn't get enough light in here to take pics without the blinds open. I only have functional things on the counter. There is too little space for anything decorative in this area. Just some baskets for produce and for my teabags. I do love my coffee, especially lattes so I'l start making those again this fall and get a new coffeemaker. The lack of cabinet space is a problem, so I just keep minimal things in all the cabinets. You don't need a lot of groceries for two people. We shop weekly, no impulse grocery purchases so we usually have room for everything. 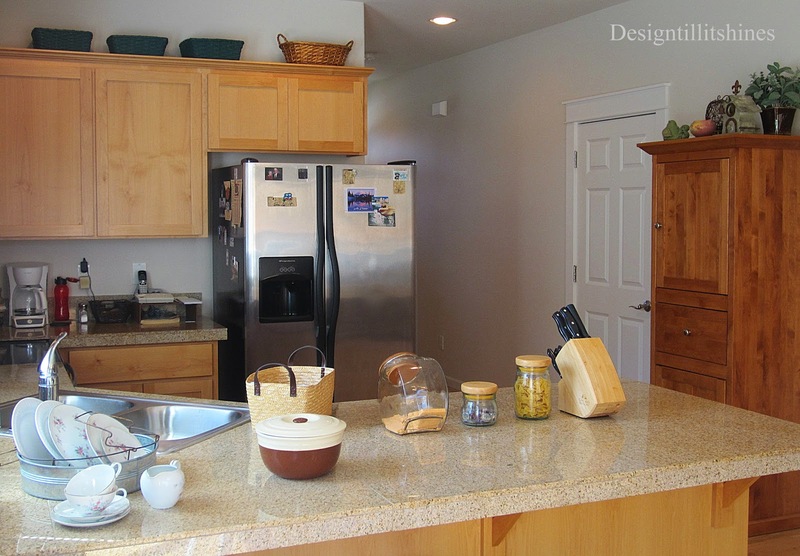 Grocery items, seasonings and cooking related items are kept in the cabinets next to the microwave. All my everyday dishes are in the two cabinets next to the fridge. We've downsized a lot so that helps with storage. We still have a lot of things in boxes though, family dishes and heirlooms so I don't know what I'll do with some of those. Lower cabinets have my cookware and other misc. I've tried to make my tiny kitchen as efficient as possible. There was room in the hallway for this small pantry that I found at a local furniture store. I like simple farmhouse style furniture so this shaker style pantry fit perfectly against this wall. I will likely paint it at some point though, since I don't like the maple stain finish as much as I used to. I have canned goods, snack items and cereal in the top section. The drawer holds extra microwave containers and misc. The bottom section stores items I don't use that often. This little pantry has helped us so much with extra storage. It needed to be narrow because of the light switch, but it is rather deep which helps. I love all the stainless appliances that came with the house. They all work great. I also love the smooth cook top on my electric range. I've always preferred gas in the past, but this smooth cook top is so easy to clean and use that it quickly sold me. The fridge is an older model, but it's nice and roomy inside. Our counter tops are granite tile and average quality. When they mass produce these houses you get few upgrades, although I do like the design and color of the granite. The counter on the left was very poorly designed. It extends all the way to the wall and also extends all the way behind the sink, so it makes it difficult to access the window to clean it, which is another reason why the window shouldn't be there. They also extended the granite too far over the counter top. We might do some remodeling in the kitchen if we live here longer than we plan to. In case that doesn't happen I'm doing my best to adjust. Right now I have storage under the counter. I've been using this area as a craft space so I keep my storage carts there. I've been holding off on getting new bar stools until I get a new dining set. I love farmhouse style and I want our living area to reflect that more, so I'll be looking for some vintage seating for the counter. Nothing too exciting here just basic kitchen items. The area in the corner behind the sink is where I have my vintage dishes displayed. The baskets actually take up more room than they appear to in these photos. I just put a few baskets together that I've been collecting to fill up the empty space. I'll likely change this a bit later. The sink is stainless and rather shallow so it will likely be replaced. I know these photos are grainy, but it just gives you another view. Real life isn't always pretty! 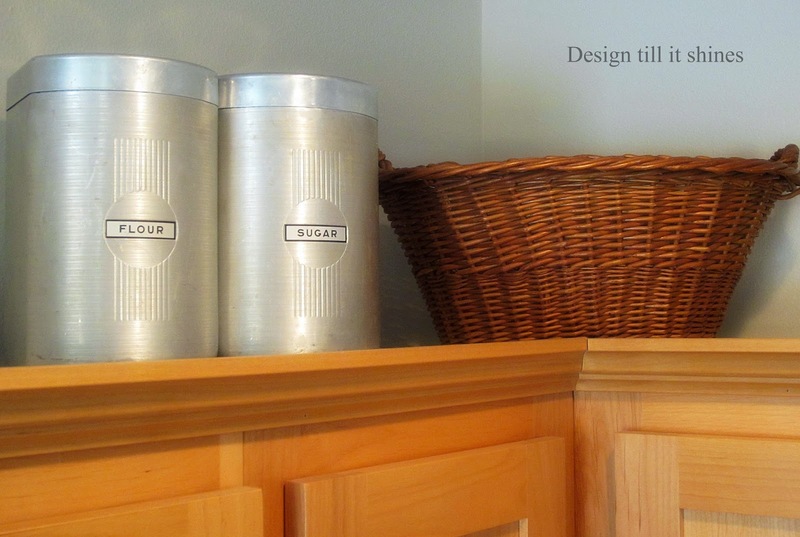 I added a couple of my art deco aluminum canisters above the cabinets. I love the simple design. 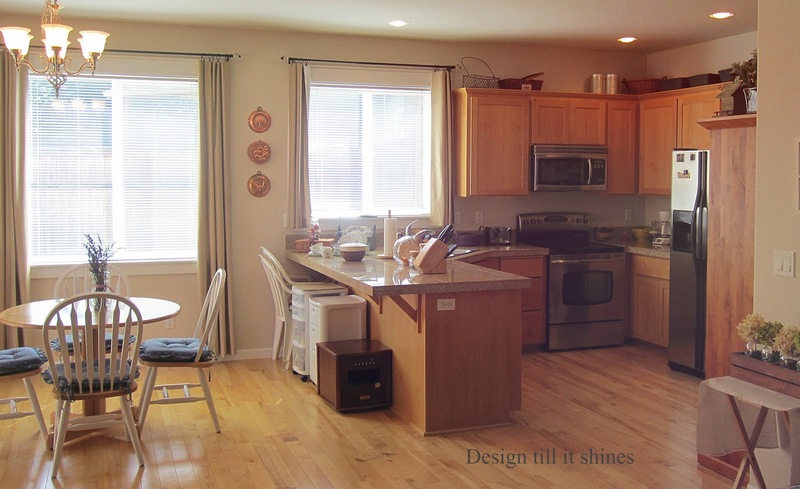 The dining and kitchen area is similar to what you would find in a condo or apartment. Our upstairs has a nice floor plan which somewhat makes up for our minimal kitchen and dining space. I do have a nice work triangle in the kitchen, since it is so small it does make it very efficient. Everything is there within a few steps. That can be a good thing or it can be annoying depending on what kind of day I'm having! I'm currently using an old dinette set and a bookcase in this corner of the dining area. I mentioned in a previous post that our old dining room furniture would not fit in here, so I have a bit of a cottage look in here right now. 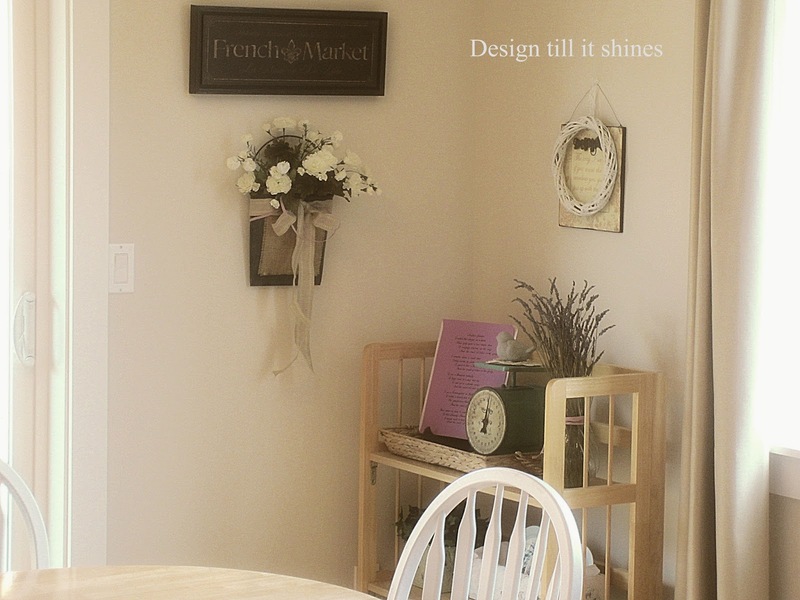 I'll be updating this corner with a farmhouse style dining table and chairs, maybe in a rustic cherry and possibly a painted corner hutch in green since I love to add color. A small corner hutch is the only style that will fit in this space, but I've seen some lovely ones on the blogs lately that inspire me. I've added a few ideas below of some styles I'm considering. Here is a sweet corner hutch I found. I love the green and the clear glass of the upper cabinets. I would definitely want beadboard and enough room inside to display quite a few things. I really love the items displayed here. Sweet and simple farmhouse style. 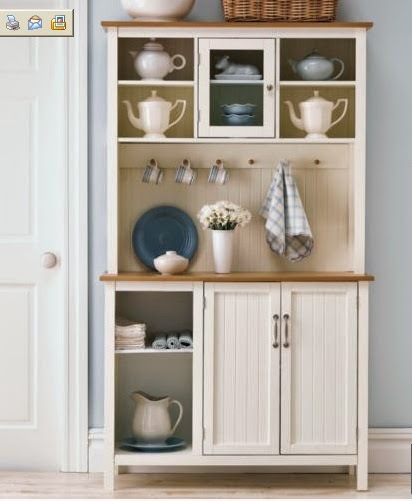 This is a hutch from Penneys that is no longer available. I liked all the cubbies on this one and the hooks for cups or towels. Very unique looking. This white one is cute with the pretty arched open space. This style would be nice but the upper cabinets are too small. 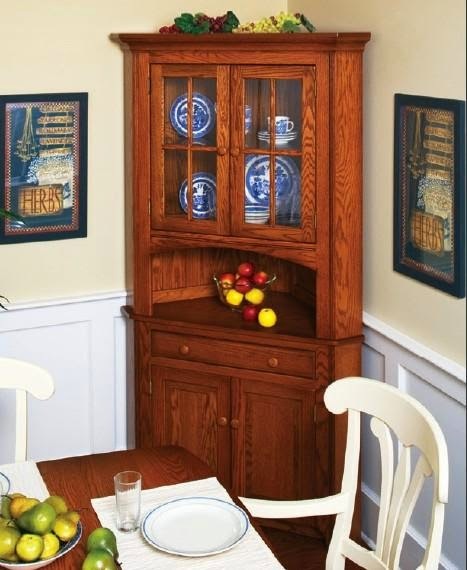 I'm not a big fan of oak, but I love the warmth of wood and the style of this simple shaker hutch. 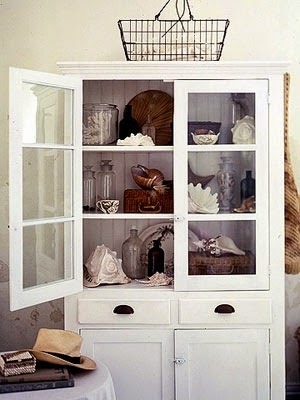 This isn't a corner hutch, but I love the upper doors on this piece and the simple beauty of all the openness. Very pretty with the shells and it would be a wonderful display piece for vintage dishes. Here are a few dining sets I found. 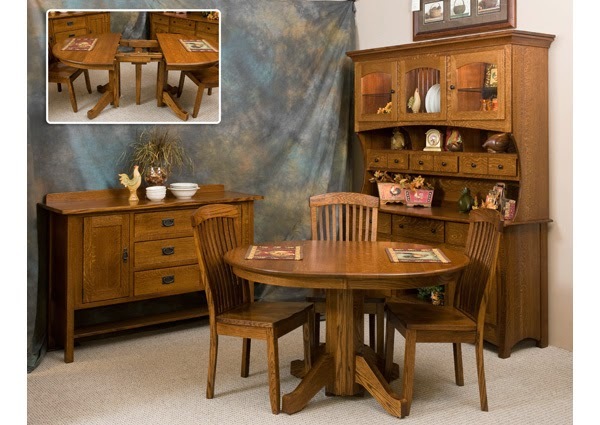 I love the simplicity and quality of Amish style furniture, but not the price. 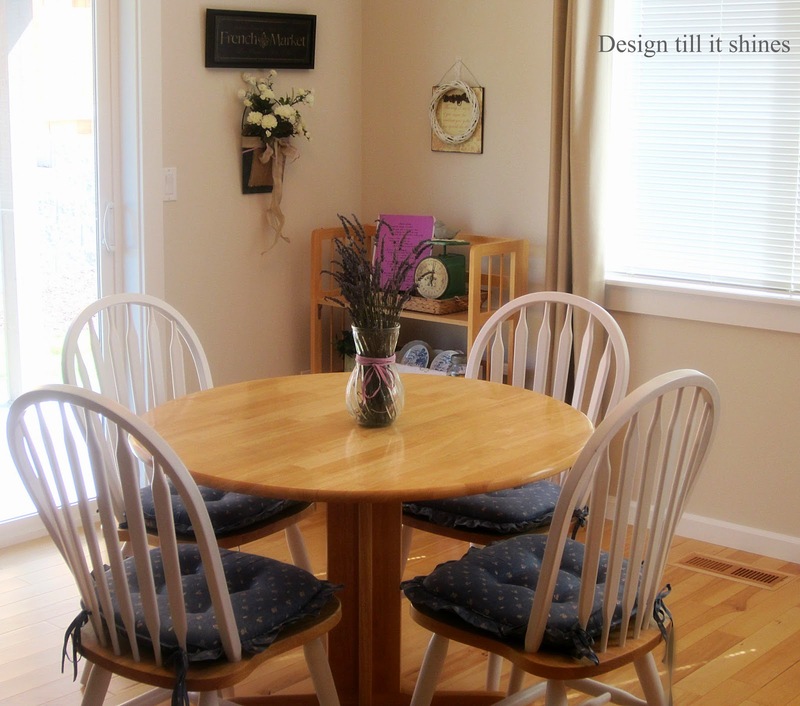 I also love vertical slats on dining chairs, very shaker style and a round table is essential for our small dining area. 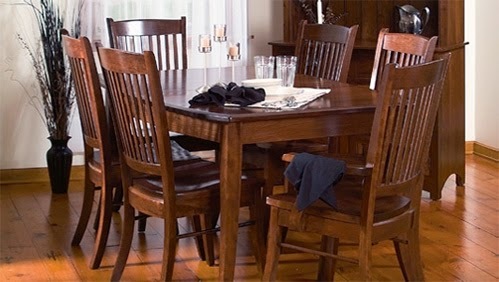 I really like the wood and finish on this dining set. Beautiful chairs. 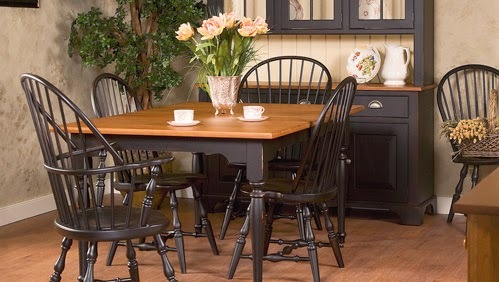 These high back Windsor chairs are so pretty. I don't know how comfortable they would be though, or practical. They have that somewhat primitive look that I love. I do have eclectic tastes in furniture. I like too many things! Our home is still a work in progress. We're going through a transition period where things are just wearing out or no longer useful, so that means a lot of small changes will be happening. I would love for those changes to happen sooner rather than later, but they will take place over time and within our budget. If you're going through an adjustment with your small kitchen please share. Well enough of my ramblings. I guess that's what happens when you don't post that often, especially in the summer months. Thanks for stopping by! It's small, but it looks really nice especially with all your charming accessories. I love those aluminum canisters. Sounds like you know just what you want and will have it looking that way in no time. Thanks for sharing your home with us. Thanks for sharing your mini kitchen tour with us. 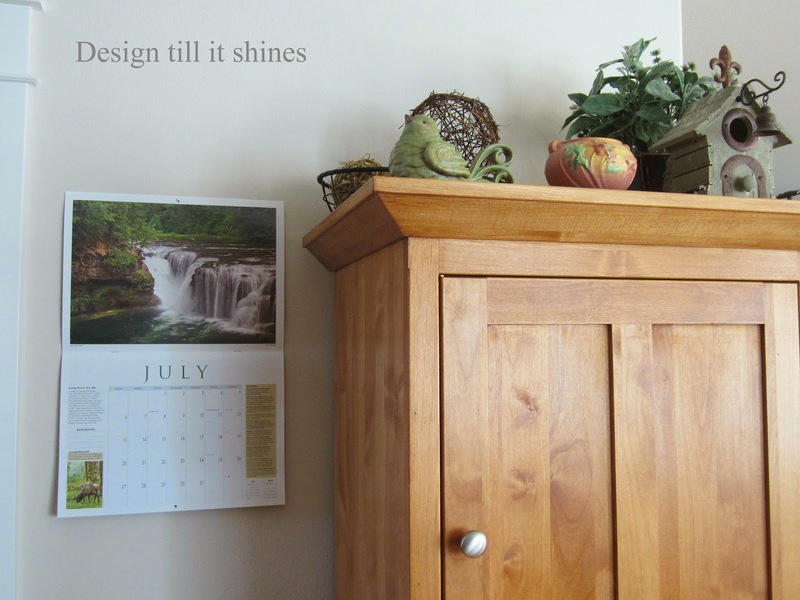 I love that you have open space above your cabinets to display things. I love the peak into your beautiful home. :) Thank you for inviting us in! I like your kitchen. It seems very open, and I love your counter tops. 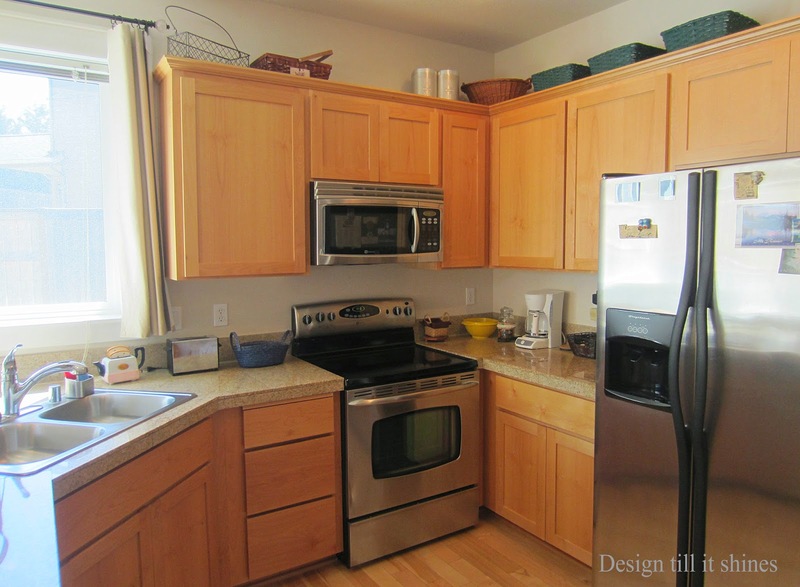 It can be challenging in a small kitchen but yours has a great layout. 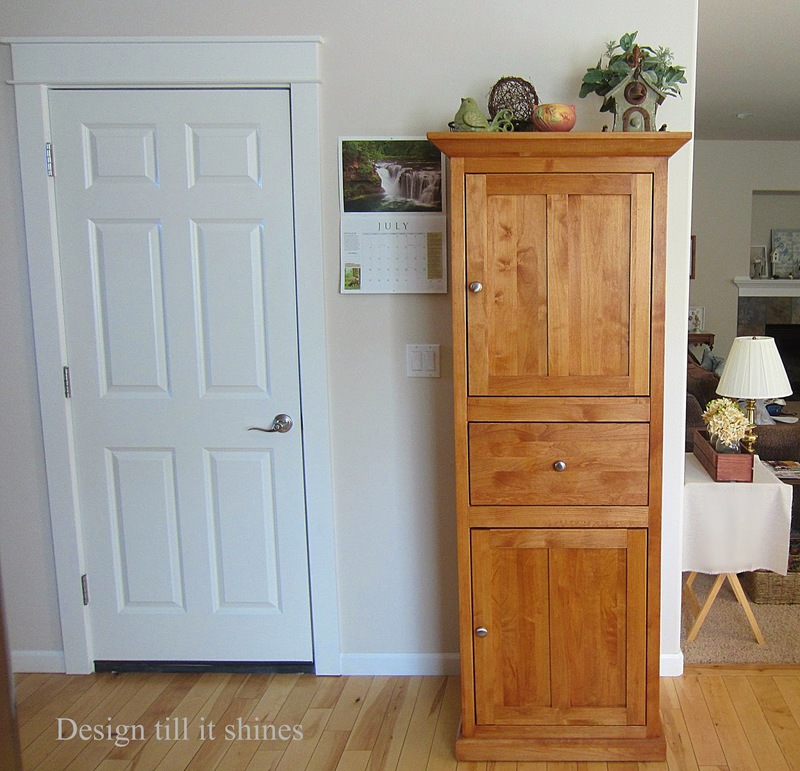 I love your shaker style cabinets, and though not real wood you could paint the and add some nice hardware. I also love the window at the kitchen sink, to me there's nothing better than sunshine and a view while doing the dishes. So many possibilities, it's nice to have options! Diane, your kitchen may be small; but you have it so organized and functional. 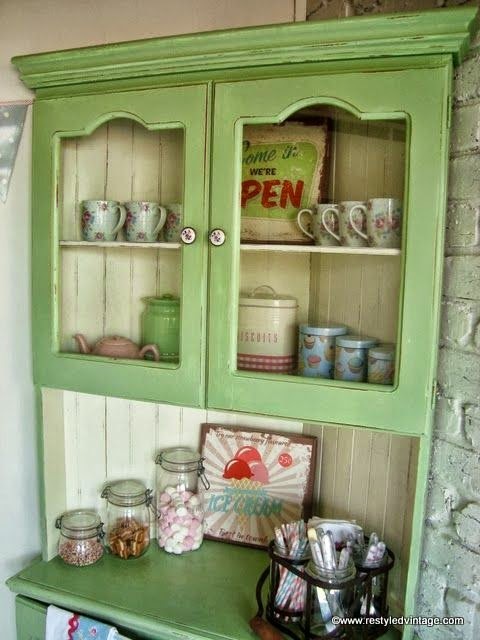 Love the green corner hutch the most! I remember the cute one from J.C Penneys. Like it too! Thanks for sharing with SYC. Hi Diane, popped over for your kitchen tour:) I love that green hutch too. You have a cool set up with your sink facing your seating area. And, tons of light. In my galley kitchen, I think I can reach everything in the whole kitchen from the sink, lol. I dream about a kitchen with an open plan and center island, but i do love my cozy cook zone:) I'm in love with yellow right now. I pinned a table and chairs refinish where she painted her tile top table white, chairs bright yellow, and hutch green like the one you showed. It looked amazing. So glad you stopped by my blog.